Note: On November 22, 2016 NASA announced that a frozen sea with as much fresh water as is in Lake Superior on Earth was found at on Mars at Utopia Planitia between 39° and 49° North. See https://www.nasa.gov/feature/jpl/mars-ice-deposit-holds-as-much-water-as-lake-superior. Note: Also see our article about BRINE ON MARS dated 4/17/2015. Early discoveries by NASA's newest Mars orbiter are starting to reveal key features about the loss of the planet's atmosphere to space over time… The observations reveal a new process by which the solar wind can penetrate deep into a planetary atmosphere. They include the first comprehensive measurements of the composition of Mars' upper atmosphere and electrically charged ionosphere. The results also offer an unprecedented view of ions as they gain the energy that will lead to their escape from the atmosphere. 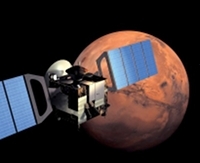 "We are beginning to see the links in a chain that begins with solar-driven processes acting on gas in the upper atmosphere and leads to atmospheric loss," said Bruce Jakosky, MAVEN principal investigator…"
On each orbit around Mars, MAVEN dips into the ionosphere… from about 75 to 300 miles above the surface. This layer serves as a kind of shield around the planet, deflecting the solar wind, an intense stream of hot, high-energy particles from the sun. Scientists have long thought that measurements of the solar wind could be made only before these particles hit the invisible boundary of the ionosphere. MAVEN's Solar Wind Ion Analyzer, however, has discovered a stream of solar-wind particles that are not deflected but penetrate deep into Mars' upper atmosphere and ionosphere. Interactions in the upper atmosphere appear to transform this stream of ions into a neutral form that can penetrate to surprisingly low altitudes. Deep in the ionosphere, the stream emerges…in ion form again. The reappearance of these ions, which retain characteristics of the pristine solar wind, provides a new way to track the properties of the solar wind and may make it easier to link drivers of atmospheric loss directly to activity in the upper atmosphere and ionosphere. MAVEN's Neutral Gas and Ion Mass Spectrometer is exploring the nature of the reservoir from which gases are escaping by conducting the first comprehensive analysis of the composition of the upper atmosphere and ionosphere. These studies will help researchers make connections between the lower atmosphere, which controls climate, and the upper atmosphere, where the loss is occurring. The instrument has measured the abundances of many gases in ion and neutral forms, revealing well-defined structure in the upper atmosphere and ionosphere, in contrast to the lower atmosphere, where gases are well-mixed. The variations in these abundances over time will provide new insights into the physics and chemistry of this region and have already provided evidence of significant upper-atmospheric "weather" that has not been measured in detail before. ...The spacecraft's Suprathermal and Thermal Ion Composition (STATIC) instrument…detected the "polar plume" of ions escaping from Mars. This measurement is important in determining the rate of atmospheric loss. As the satellite dips down into the atmosphere, STATIC identifies the cold ionosphere at closest approach and subsequently measures the heating of this charged gas to escape velocities as MAVEN rises in altitude. The energized ions ultimately break free of the planet's gravity as they move along a plume that extends behind Mars. Normally I don't discuss the so called Torah Code on my site. My father is a big believer, but the idea that there is a predictive code based on Equidistant Letter Sequence (ELS) in the 304,805 letters of Torah (Genesis through Deuteronomy) remains a highly contested one among some of the leading mathematicians in the world. You can read about Code Basics HERE. But even a broken clock is right twice a day, and as I started to write this article an Atlas 5 rocket with MAVEN sat poised a few miles north of my parents' home in Cape Canaveral, ready to blast off for Mars on November 18, 2013. Its mission is to determine how the Martian atmosphere (i.e. atmospheric pressure) and water (ocean) were lost over time. On the matrix below, the axis term is MARS MAVEN. At an ELS on the matrix is ATMOSPHERE and VOLATILE. PRESSURE is at the same absolute skip as MARS MAVEN. In the open text is LET THE WATERS BE GATHERED FROM UNDER THE HEAVENS TO ONE PLACE AND LET APPEAR THE DRY (LAND). This article will look at what happened to the atmospheric pressure (which we believe we can prove is much higher than NASA reports) and to the ancient Martian ocean (which we believe is to be largely found underground on Mars today). While the matrix may be coincidental, it does at least inspire some thoughts that we will present below. Figure 1 above: Torah Codes matrix with Mars MAVEN as axis term (first term sought). Our arguments against Mars having lost most of its atmosphere are contained in the Basic Report and PowerPoint for our report entitled CRITIQUE OF NASA'S MARTIAN WEATHER DATA WITH EMPHASIS ON AIR PRESSURE. For the two links just provided, the Basic Report is dated July 5, 2018 while the PowerPoint is dated March 27, 2018. The most current versions of these items are always to be found at http://davidaroffman.com/catalog_1.html. You may find it easier to read our reports in 12 sections starting at http://davidaroffman.com/photo5_1.html. However, the easiest and most pleasurable way to understand our argument is just to go through the PowerPoint. Figure 2: Cover of our PowerPoint. It shows that the pressure essentially pegged out at the maximum pressure that MSL was designed to measure (11.5 mbar). The average pressure shown for Sol 370 was 11.49 mbar. This proves that the transducer sent could not measure the actual maximum pressure seen at Gale Crater on Mars. JULY, 2018: Major points of the Sky & Telescope article Mars's Lost Atmosphere. 1. Atomic mass determines the rate of escape of an atom from the Martian atmosphere into space. The lightest isotope of hydrogen (protium) should escape faster than deuterium. N14 escapes faster than N15, and Ar36 leaves faster than Ar38. 2. The major atoms that were observed lost to space are hydrogen and oxygen. They come from H2O and CO2 broken apart by ultraviolet light(µv). Hydrogen isn’t lost at a constant rate. Greatest loss is when dustiest. Dust warms the atmosphere allowing the water source of hydrogen to rise higher where escape is possible. 3. Oxygen loss is by photochemical loss. Ionized O2+ combined with an electron to form a neutral molecule. The recombination releases enough energy to break the molecule into two separate atoms to form. One may escape to space. 4. Mars is losing 2 to 3 kg/sec. That is 10 million billionths (10-16) of the total atmosphere lost each second. Over 4 billion years it could have removed enough hydrogen and oxygen to create a layer of water a few meters thick. Equivalently, the oxygen that has been lost made enough carbon dioxide to make an atmosphere 10 times thicker than the present 6 mbar pressure. As we will discuss below, this figure is contracted by a NASA press conference about Mars MAVEN held on November 5, 2015. Mars has lost about 98% of its original atmosphere - it's both been lost to space and locked up in surface minerals and ice. 5. Mars has lost about 98% of its original atmosphere - it's both been lost to space and locked up in surface minerals and ice. 6. They think argon-38 settles lower in the atmosphere more than argon 36, creating a predictable ratio. Because argon is a noble gas it can't be removed by chemical reactions. They refer to SAM instrumentation on MSL Curiosity for measurements of argon at Gale Crater, Mars. Based on measurements from Curiosity and MAVEN they think Mars has lost about two-thirds of its argon to space, but that figure doesn't match the 98% loss rate for everything else. b. “The many ways that the upper atmosphere and the solar winds could interact, not to mention the many ways these ways could interact, make the work similar to unravelling the proverbial Gordian know. Mars is a complex planet. Goings-on in the deep interior, surface, upper atmosphere, and solar wind all link together, sometimes strongly, and we have to understand the interactions between each of the components in order to understand the systems as a whole." c. Results are based on only one Martian year. Not every year is the same as is shown with the current (2018) global dust storm which has totally blacked out the sun at the Opportunity Rover. The article went to press just before the 2018 storm. d. The sun goes through an 11-year cycle which changes the properties of the solar wind and our own star's output. e. They admit that they aren't sure of what the most common behavior is of the modern atmosphere. They admit that this means that "the extrapolation of prsent day loss rates into the past carries some uncertainty. Rebuttal to Sky & Telescope: Our most important rebuttal is to points 4 and 5 above. What MAVEN can measure is an amount of gas detected as "lost" at altitudes of 93 to 3,900 miles above Mars. NASA then uses the 6 mbar pressure figure and compares the density associated with that found at altitude. Using what is certainly a low density figure (based on the all vigorous weather found at low altitude) NASA then asserts that at that rate of gas loss, Mars has lost about 98% of its original atmosphere. Based on the altitude of stratus clouds 13 km above areoid, 16 km above PathFinder, and the maximum altitude of these clouds above Earth, we estimate pressure at areoid (the Martian equivalent of sea level) at 511 mbar rather than 6 mbar. See Section 12.5 of our Basic Report. Our Basic Report offers an abundance of evidence that the two types of pressure sensors (Tavis or Vaisala) clogged on landing. The 2018 dust storm should cause greater pressure (due to the weight of the dust) at Curiosity in the current Martian year than we saw in the previous Martian year even though the Rover is a little over 200 meters higher. But the reported (manufactured) pressure is running a good bit lower. We think that is because the calculations for the manufactured data failed to account for the weight of the dust. We discuss this in the next section of this article. Point 4 was directly contracted by a NASA MAVEN Mission Briefing. See 18:39 into the video. Rather than offering a loss rate of 2 to 3 kg per second (2,00 to 3,00 grams) we are told that the rater of loss was only about 100 grams per second! So Sky & Telescope overstates the mass loss by a factor of 20 to 30. When the 2018 Global Dust Storm hit MSL µV levels dropped to low (which is very rare on Mars). Although this storm totally blocked out the sun at MER Opportunity enough sunlight had been blocked at MSL to prevent shadows from being formed, and to obscure many geographic features. When we saw similar dust storm on Earth darken Luke Air Force Base pressure rose by at least 6.6 mbar (660 pascals) in an hour. Even if we say that gravity on Mars is only 38% of Earth's, an overhead mass of dust with a similar weight should produce an increase in pressure of a least 38% of 6.6 mbar. That's about 2.598 mbar which is 250.8 Pa.
Let's look at how our spreadsheets that cover the 2018 dust storm at MSL. The second Table below shows the weather from MSL Sol 2080 (about a day before the storm arrived) up through Sol 2097. The µV dropped from high in Sol (Martian day) 2080 to low by Sol 2082 (see Column R). Looking at Column C for the pressure during the storm, and Column Q for the pressure at the same Ls in the previous Martian year, pressures in Year 4 dropped by 13 to 24 Pa from the previous year. The average drop in pressure was about 17.8 Pa which is similar to what we were seeing before the dust arrived. At Sol 2090 MSL Curiosity was at an altitude of about 4,193 meters below areoid. The Sol from the previous Martian year where the solar longitude (Ls) was the same was Sol 1422 which was 8/6/2016 on Earth. At that time Curiosity was about 4,400 meters below areoid. So it climbed about 207 meters since then. Based on a scale height calculation with 610 Pa (6.1 mbar) at areoid, climbing 207 meters from 4,400 meters to 4,193 below meters pressure should drop 17.4 Pa IF there is no dust storm. The scale height calculation is given below. What does it mean that the scale height calculation for drop in pressure due to increase in altitude (17.4 Pa) almost exactly matches the drop in pressure supposedly measured by MSL (17.8 Pa - a 97.75% agreement? It means that the NASA data is not credible. While some team player took the time to do the scale height calculation before giving us false data, he (or she) forgot that dust adds weight to the atmosphere. The pressure should have increased - probably by at least 100 Pa - rather than decreased. If it got as dark at MSL as it was at Opportunity due to this storm then the pressure should have gone up by about 233 Pa (the 250.8 Pa calculated above considering Mars gravity minus the 17.8 Pa lost due to altitude increase). We must therefore conclude that again we see the REMS Team caught manufacturing data. SO WHAT HAPPENED TO THE WATER ON MARS? On September 26, 2013, JPL announced that the MSL Rover Curiosity had found that Martian soil at Gale Crater was 2% water, meaning that there are 2 pints of water in every cubic foot of soil. When we heard this we scooped up a cubic foot of dry sand from the beach at Cape Canaveral. We weighed an ice chest (8 pounds), then put in the sand and weighed them together (92.6 pounds). Then we poured in two pints of water. One pint of water weighs 0.96 pounds, so two pounds is 1.92 pounds. We had a crude scale that only shows increases in weight of 0.2 pounds, but we noted that after we poured the two pints in, the weight increased to about 94.6 pounds. We then placed the entire set up on our covered balcony with the lid open for a week, and checked it again. After the week the water was gone, the sand was dry, and weight was back to the original weight. All the loss of water had occurred in Florida very close to sea level, with an average pressure of about 1,013.25 millibars. On Mars the average pressure is supposed to be 6.1 millibars, although it is more at Gale Crater (below areoid - the Martian equivalent of sea level) where the Mars Science Laboratory rover Curiosity has been exploring since August 6, 2012. The average daily measured pressures at Gale crater (after NASA edited out exceptions that we noted in Table 3 of our Basic Report) have been between 7.15 and 9.25 millibars. And yet, the sand there has not been dried out. It is, in fact, quite wet. So where is the moisture coming from? Is it being absorbed out of an obviously dry atmosphere, as NASA has alleged, or is it coming from a large source underground? Perhaps MSL has given us a clue. Although the daily weather reports put out by the MSL Rover Environmental Monitoring Station (REMS) Team have listed relative humidity as not available from the start of the mission, there has been a report of radically varying relative humidity at Gale Crater with such variations seen over a very small area (in fact, about 400 meters). These variations are shown on the next two figures. Figure 3: The REMS Team alleges large changes in relative humidity over small distances and with fairy constant temperatures. The relative humidity data shown on Figures 3 and 4 are NOT matched by their daily reports which never showed data for relative humidity. Figure 4 adapted from the REMS Team: On June 27, 2013 REMS published this chart, but it continues to leave relative humidity reported only as --% on all its daily MSL weather reports. lt isn't just that so much water was seen at Gale Crater. In fact, there has also been been a discovery that there is more water in the atmosphere than NASA thought before. Given how much water we now know is just under the surface, this shouldn't surprise us, but it may be evidence of higher pressure than our faulty pressure transducers were capable of measuring after their tiny dust filters clogged with dust immediately upon exposure to the very dusty Martian atmosphere. On September 29, 2011 the following article (in dark blue font) was found at http://sci.esa.int/science-e/www/object/index.cfm?fobjectid=49342. It should be read in conjunction with our article in conjunction with our 511 mbar Mars areoid pressure estimate located HERE. Although numerous spacecraft have visited Mars over the past half a century, very few direct measurements of the vertical structure of the planet's atmosphere have been made. Since most of the spacecraft instruments have looked down at the surface, it has only been possible to infer the horizontal distribution of gases in the atmosphere, leaving the question of how water vapour is being mixed into the atmosphere almost unexplored. This lack of direct measurements has meant that descriptions of the vertical distribution of water vapour – a key factor in the study of Mars' hydrological cycle – has generally been based upon global climate models. This gap in the data has now been addressed by the SPICAM (Spectroscopy for Investigation of Characteristics of the Atmosphere of Mars) imaging spectrometer on Mars Express. The instrument can be used in occultation mode, when it studies light from the Sun that has passed through the planet's atmosphere just after sunrise or before sunset. The measurements can then be analysed to generate vertical concentration profiles for several atmospheric constituents, including water vapour. Under normal conditions on Earth, water vapour condenses around tiny dust or aerosol particles or salts when the atmospheric temperature drops below a certain "dew point". The atmosphere is then said to be "saturated", since it cannot hold any more moisture at that temperature and pressure. Any water vapour in excess of the "dew point" will normally condense to form droplets or icy crystals. However, supersaturation may occur when some of the water vapour remains in the atmosphere, instead of condensing or freezing. When condensation nuclei (assumed to be dust aerosols on Mars) are too rare, condensation is impeded, leaving substantial amounts of excess vapour. "The vertical distribution of water vapour is a key factor in the study of Mars' hydrological cycle, and the old paradigm that it is mainly controlled by saturation physics now needs to be revised," said Luca Maltagliati. "Our finding has major implications for understanding the planet's global climate and the transport of water from one hemisphere to the other." "The data suggest that much more water vapour is being carried high enough in the atmosphere to be affected by photodissociation," added Franck Montmessin, also from LATMOS, who is the Principal Investigator for SPICAM and a co-author of the paper. "Solar radiation can split the water molecules into oxygen and hydrogen atoms, which can then escape into space. This has implications for the rate at which water has been lost from the planet and for the long-term evolution of the Martian surface and atmosphere." "Evidence of Water Vapor in Excess of Saturation in the Atmosphere of Mars", by L. Maltagliati, F. Montmessin, A. Fedorova, O. Korablev, F. Forget, and J.-L. Bertaux, published in the 30 September 2011 issue of Science. ROFFMAN TEAM COMMENT: While this article does a good job of explaining how much water vapor exists at altitudes over Mars, and how some of that water vapor would break down into hydrogen and oxygen before escaping to space, it makes no effort to identify (the obviously underground) places that are the sources of the water. Figure 5: Spirit Rover Tracks. The tracks look like they are wet. This was matched with MSL where 2 pints of water was found in every cubic foot of soil. The sky color here does NOT match the blue sky seen by MSL at Gale Crater. We believe the color shown here is wrong. This image is the 'Santa Anita' Panorama from the JPL MER website: http://marsrover.nasa.gov/gallery/panoramas/spirit/2004.html "acquired from a position roughly three-fourths the way between "Bonneville Crater" and the base of the "Columbia Hills." "
“Most dramatic of all was not the how of the flooding but the when—and the when was extremely recent. The age of surface features on worlds can be determined by the simple expedient of counting craters… heavily cratered surfaces are typically old; ones with fewer craters have been resurfaced comparatively recently… In the case of Martes Valles, there appear to have been two episodes of volcanic resurfacing—one 500 million years ago and one just 10 million years ago. The flood channels cut into the older of the two and are partly obscured by the younger. “So the flooding is framed by those dates, taking place sometime between 10 and 500 million years back,” says Morgan. If this is so, then Mars MAVEN may be looking in the wrong place. It can measure what is high, but not what is underground. Frankly, NASA now says that what was found at Gale Crater is likely to be true all over the planet. It is wet just below the surface everywhere or at least over a very wide area. This comes as no surprise to us here. We have long observed tracks of earlier rovers and noted that they seem to expose wet material just under the surface. So the real question may be not Mars how lost its oceans, but why they sank. The Torah Code matrix at the start of this article cites waters gathered to one place. On Mars now that place is underground, not out in space where MAVEN will search. What us needed are seismic portraits of Mars. The density on that planet (3,933 kg/m3) is a good bit less than on Earth (5,514 kg/m3), which may imply vast pockets of space and/or abundant water under the surface. STATISTICAL SIGNIFICANCE OF THE MATRIX. Torah Code statistical significance is explained on my father's site at http://arkcode.com/rich_text_4.html and at http://arkcode.com/photo2_1.html. As per my father's standard protocol, no statistical significance is assigned to the axis term, here the only ELS of the longest and best spelling for MARS MAVEN. The three a-prior key words did not have very high statistical significance but the verse found in the open text did and it was the inspiration for this article. However, the statistical question was where to cut off the open text presentation. The section LET THE WATERS BE GATHERED FROM UNDER THE HEAVENS TO ONE PLACE AND LET APPEAR THE DRY (LAND) includes a number of important Mars-related items. It deals with water, where it is gathered to, the fact that it is under the heavens (or sky), and that dry land (like the planet Mars) would appear after that. To show all this and other key words requres 39 columns and a matrix 1,014 letters in area. If we just include everything up to ONE PLACE then we only need 29 columns and 754 letters. While this cuts off AND LET APPEAR THE DRY (LAND), it points well enough to the water issues in this article, so we made the cut there. As such, the odds against LET THE WATERS BE GATHERED FROM UNDER THE HEAVENS TO ONE PLACE appearing so close to MARS MAVEN were about 404 to 1. The next most significant term was PRESSURE at a special case skip (here the absolute skip of the axis term). That match was found against odds of about 13 to 1. ATMOSPHERE and VOLATILE were each more likely to appear at an ELS than calling a coin toss correctly. Overall, the matrix appears against odds of about 15,351 to 1.